Grandfather Bear is telling Little Bear a spooky story. 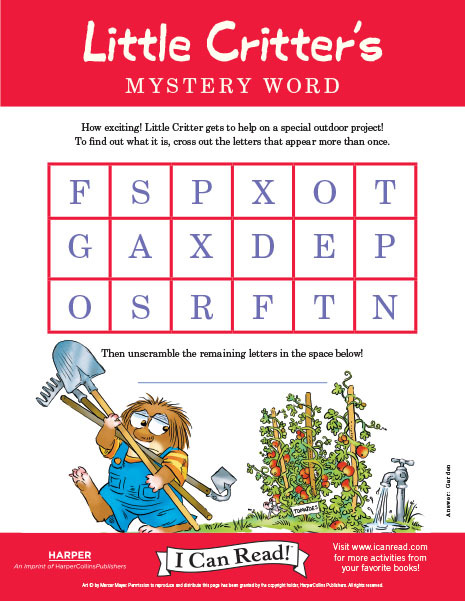 To find out what it is about, cross out the letters below that appear more than once and reveal the mystery word! 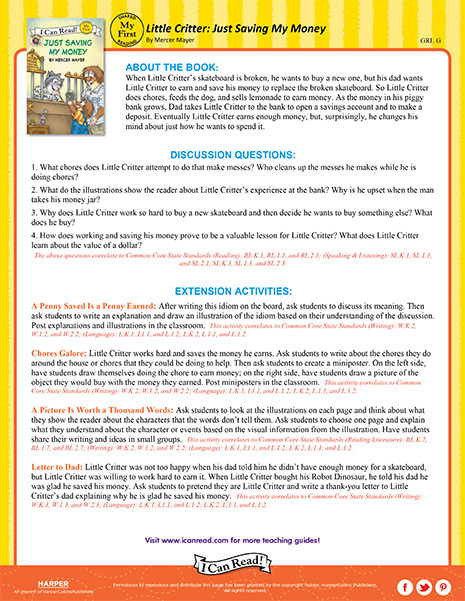 Download a free Teacher’s Guide for Little Critter: Just Saving My Money, a My First I Can Read! book by Mercer Mayer! Little Critter My First I Can Read! How exciting! Little Critter gets to help on a special outdoor project! 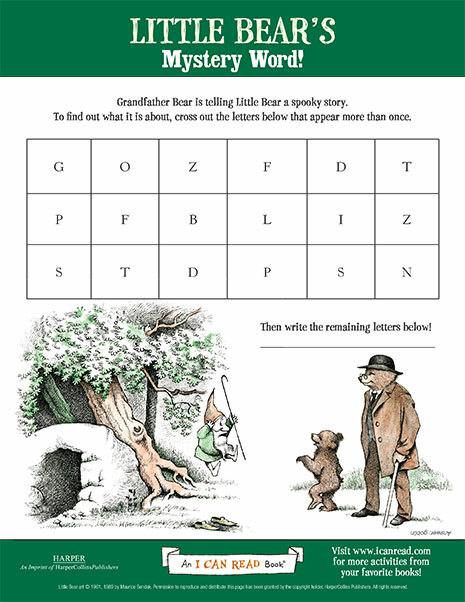 To find out what it is, cross out the letters that appear more than once and reveal the mystery word. Download a free Teacher’s Guide for Long, Tall Lincoln, a Level 2 I Can Read! book by Jennifer Dussling! 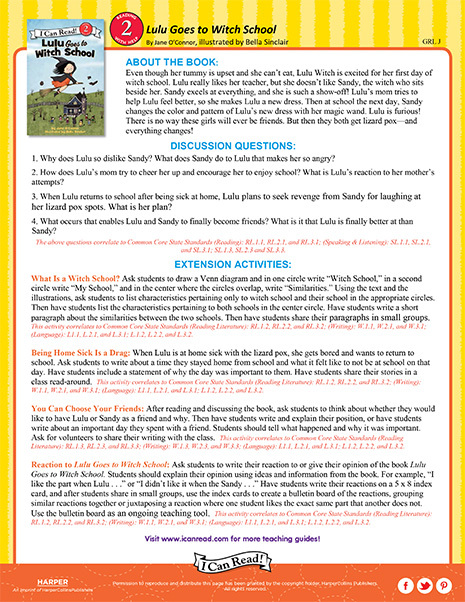 Download a free Teacher’s Guide for Lulu Goes to Witch School, a Level 2 I Can Read! book by Jane O’Connor! The Chipmunks love to have fun! 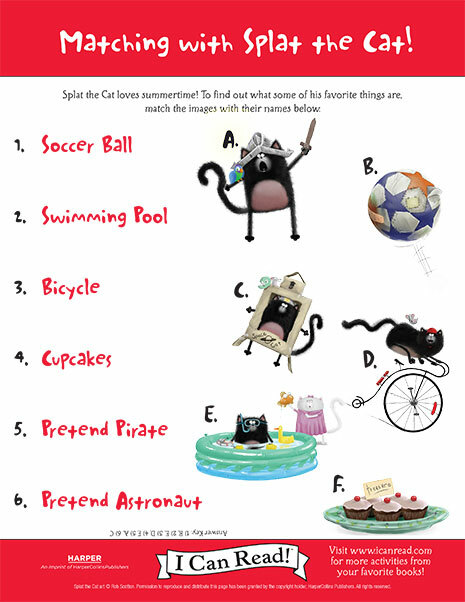 Match some of their favorite things with the right names! Biscuit loves to play outside! 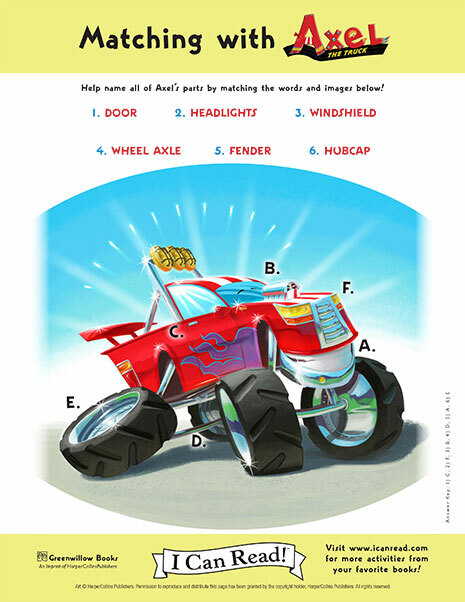 To find out what some of his favorite toys are, match the images with the words! Biscuit My First I Can Read! RRRRRRROOOWW-OOOOH! 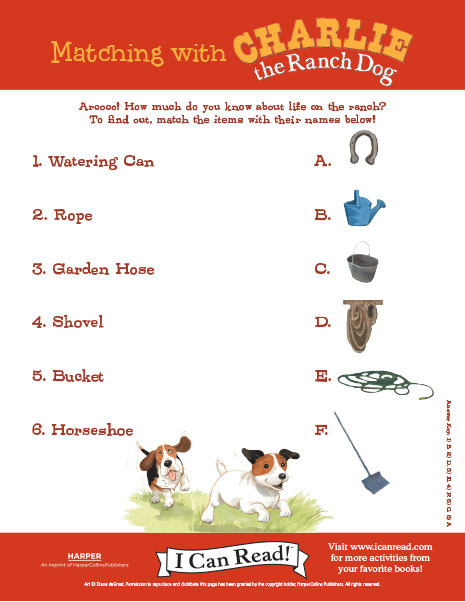 How much do you know about life on the ranch? To find out, match the items with their names below! Clark the Shark is excited to go to school—maybe a little too excited! 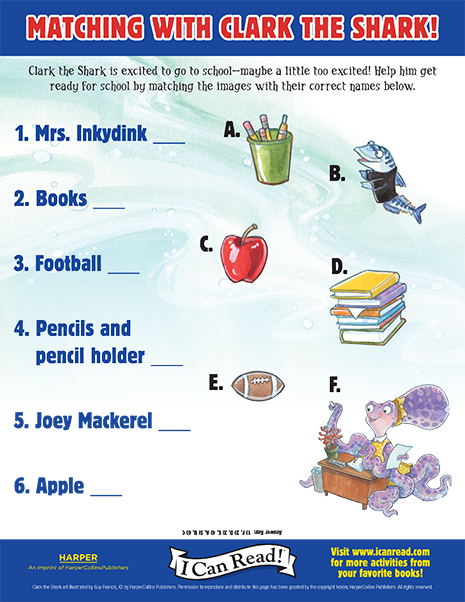 Help him get ready for school by matching the images with their correct names below. 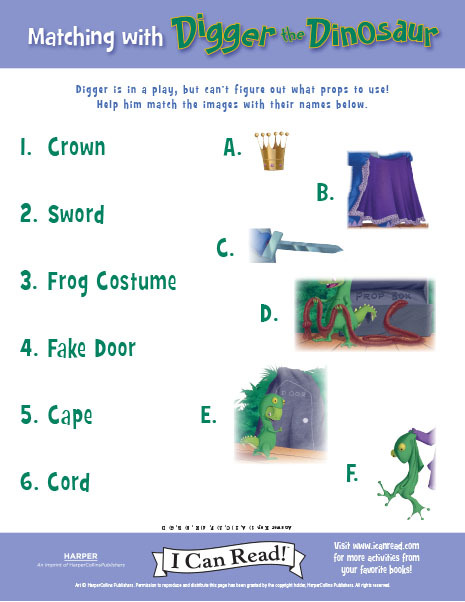 Digger the Dinosaur is in a play but can’t figure out what props to use! Help him match the images with their names. Digger the Dinosaur My First I Can Read! 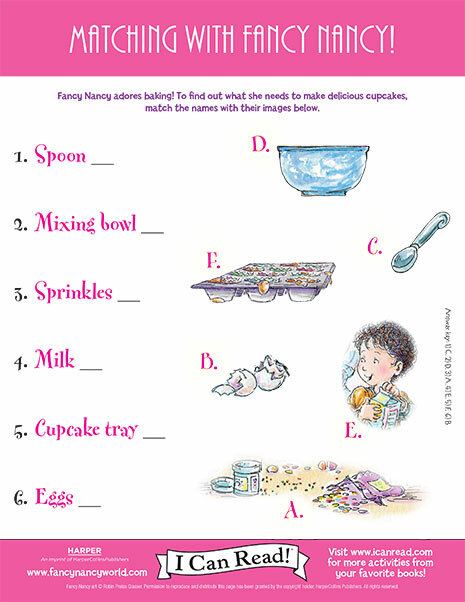 Fancy Nancy adores baking! To find out what she needs to make delicious cupcakes, match the names with their images. 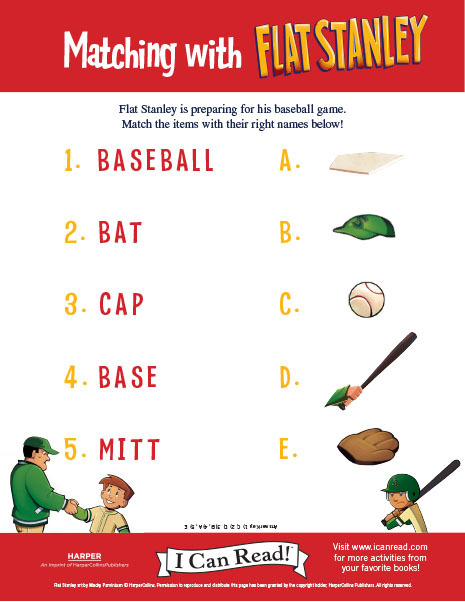 In Flat Stanley at Bat, Flat Stanley is preparing for his baseball game. 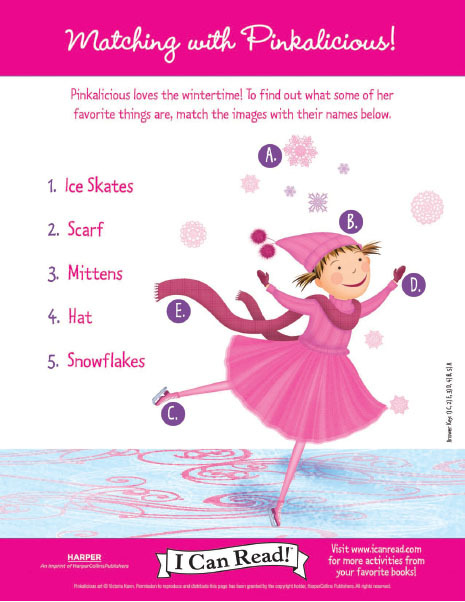 Help Flat Stanley match the items with their right names! 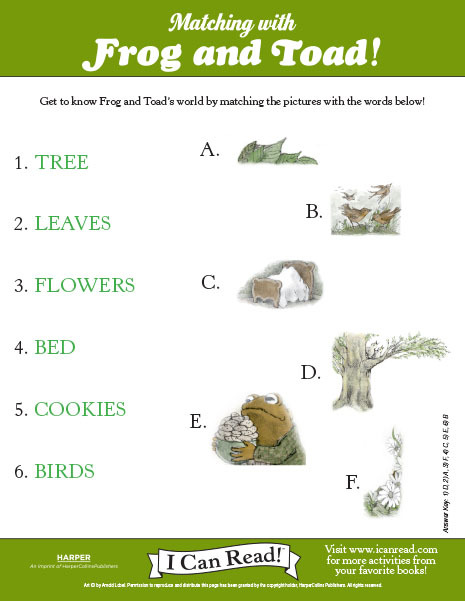 Get to know Frog and Toad’s world by matching the pictures with the words. Little Bear has many wishes. To find out what they are, match the images with their names. In Little Critter: Going to the Sea Park, Little Critter sees many sea animals. 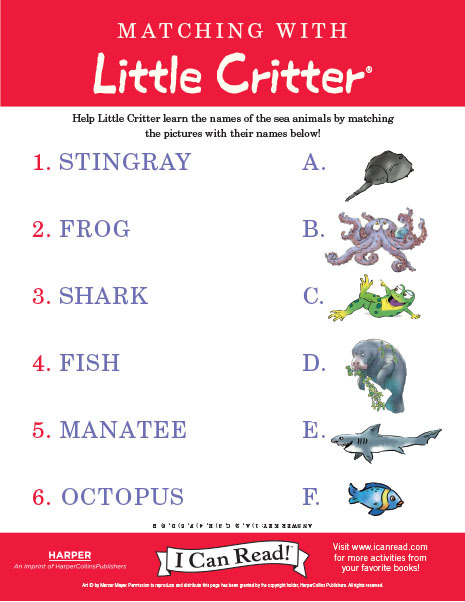 Help Little Critter learn the names of the sea animals by matching the pictures with their names. Mia loves ballet! 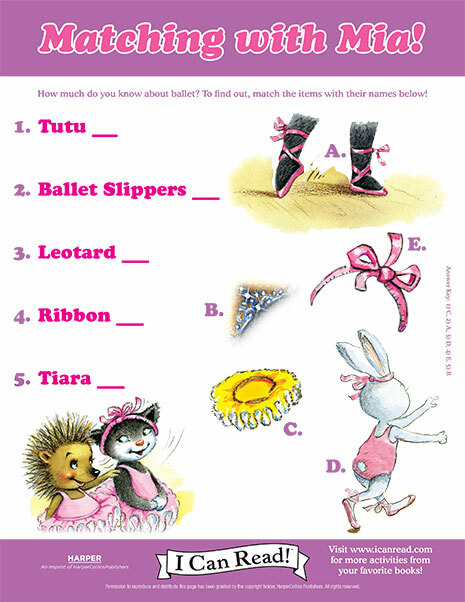 How much do you know about ballet? To find out, match the items with their names. Mia My First I Can Read! 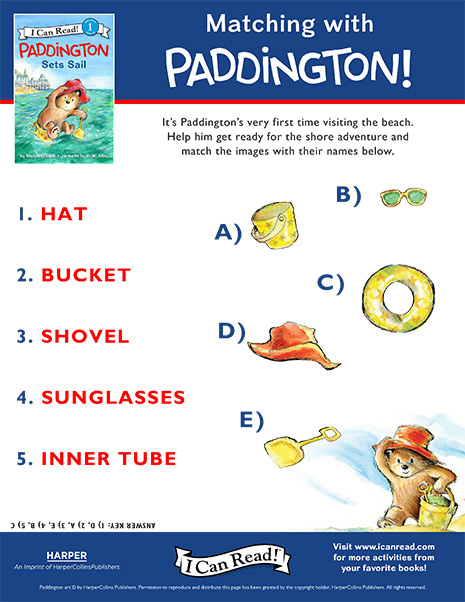 It’s Paddington’s very first time visiting the beach. 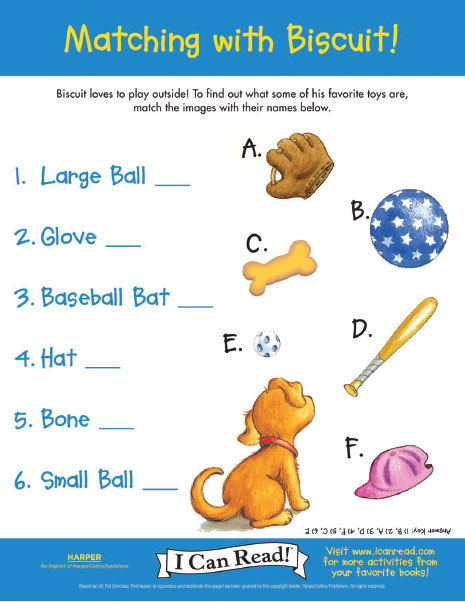 Help him get ready for the shore adventure and match the images with their names. Help Penny match the items with their names! 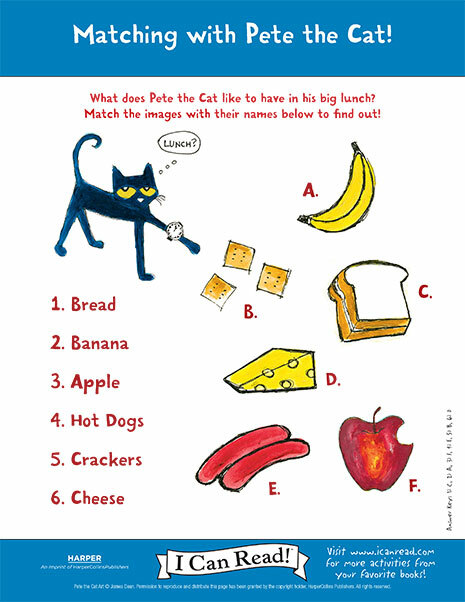 In Pete the Cat: Pete’s Big Lunch, there is something Pete the Cat likes to have in his big lunch. Match the images with their names below to find out what it is! Pete the Cat My First I Can Read! 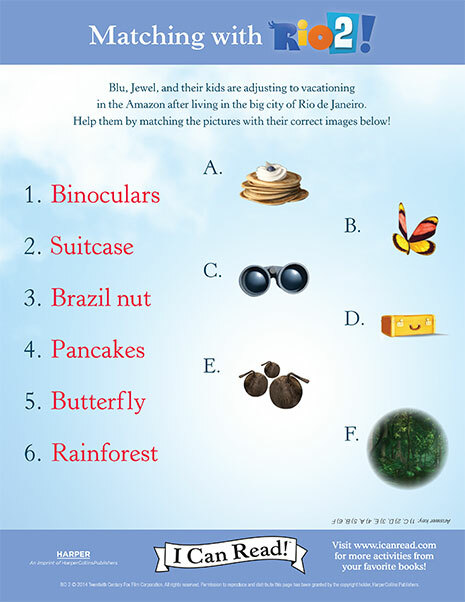 Blu, Jewel, and their kids are adjusting to vacationing in the Amazon after living in the big city of Rio de Janeiro. 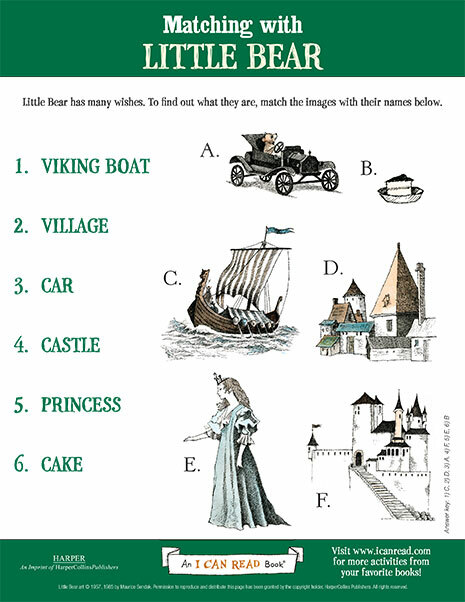 Help them by matching the pictures with their correct images. Splat the Cat loves summertime! To find out what some of his favorite things are, match the images with their names. 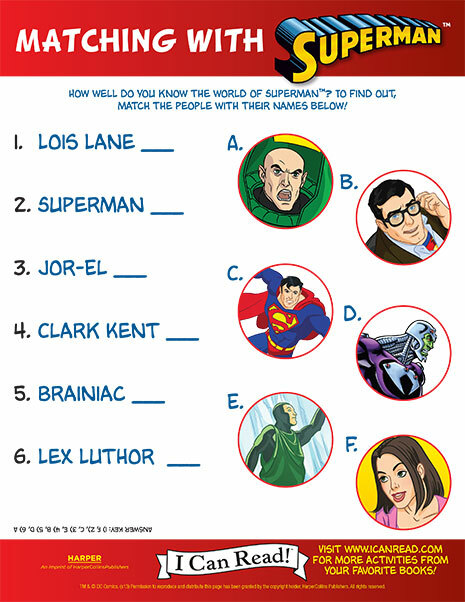 How well do you know the world of Superman? To find out, match the people with their names! 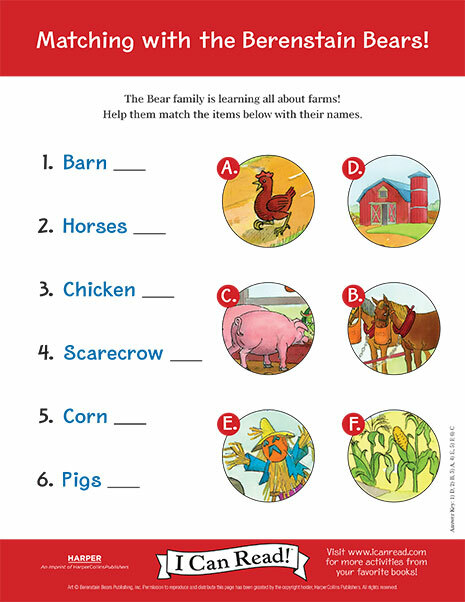 In The Berenstain Bears Down on the Farm, the Bear family is learning all about farms! 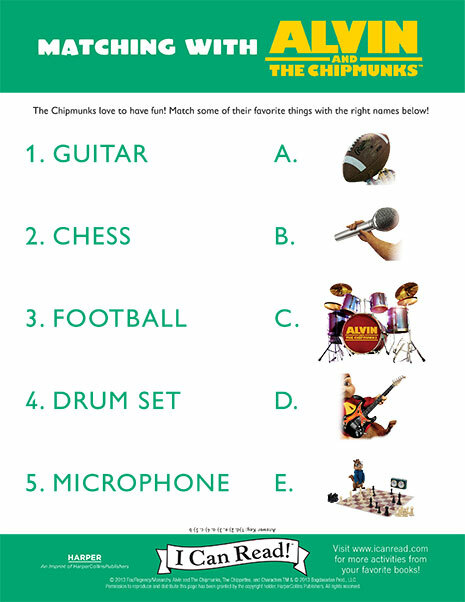 Help them match the items below with their names.